It was a busy weekend in our household. My Bostonian parents came down to Nashville to meet Fearless Baby, their very first grandchild. =) On their first evening, the weather was gorgeous, so we decided to do some grillin’ – a fantastic, simple meal of hamburgers, grilled veggies, pasta salad, + potato salad. For dessert, I wanted something that would pair well with the “cookout” theme, + was quick + easy enough for a new mom to make in a few minutes. So, I gave these s’mores bars a try! So, how were they? Absolutely scrumptious. From the buttery graham cracker layer to the melty chocolate layer + the soft, sweet marshmallow layer, they are summery, s’mores-y perfection. And, as a huge bonus, they were super quick + easy to make – I managed to whip everything up, get it in the oven, + already have it baked + cooling in the span of one Fearless Baby naptime, which was fantastic! So, if you’re looking for a summery dessert that will perfectly complement a cookout dinner, give these fabulous bars a try! In a large bowl, cream together butter + sugars until light + fluffy. beat in egg + vanilla. In a small bowl, whisk together flour, graham cracker crumbs, baking powder + salt. Add to butter mixture + mix at a low speed until just combined. Divide dough in half + press that half of dough into an even layer on the bottom of the prepared pan. place chocolate bars over dough. (Two king-sized Hershey’s bars should fit perfectly side by side, but break the chocolate if necessary to get it to fit in a single layer about 1/4″ thick.) Spread marshmallow creme/fluff over the chocolate layer. Place remaining dough in a single layer on top of the fluff (most easily achieved by flattening the dough into small shingles + laying them together). Bake for 30-35 minutes, until lightly browned. Cool completely before cutting into bars. These sound like such a lovely treat! Yum! Congratulations on your first baby-napping-recipe-making adventure success! These look absolutely delicious. Glad to read bebe is still letting you get in the kitchen, lol! These bars look fantastic. You cannot beat a s’mores dessert! We made s’mores this weekend too – I love the idea of turning them into a bar. Yay for s’mores to celebrate the fearless baby! I bet your folks think your precious little one is just the cats meow! Grandchildren are the absolute best. This recipe looks delicious and is one which will I will definitely try. They do think she’s pretty darn great, Sue! =) Hope you love this recipe when you try it! Look at you, little super mama! I think I would have just shaken something out of a box, haha! These bars are fantastic, Amy. They look so scrumptious and easy peasy. Perfect for a lazy non-mom like me, haha! They look incredible, ooey gooey goodness! Congratulations on the baby! Things must be hectic but so exciting and I am very happy for you. We went camping last weekend and had some chocolate smores brownies, I think these would have been perfect too! Ooh, s’mores brownies sound AMAZING! Amy, these look fabulous. Simple is always delicious. That mallow middle is calling my name. And eat these s’mores, they look utterly perfect in bar form! I’ve never made a smores bar before and these sound yummy and gooey and wonderful. Amy, these look fantastic! I can’t wait to try them. I have some friends who are CRAZY about anything s’mores, so this will definitely earn me points with them. And congrats on baby!!! June babies are great! My baby just turned 4 years old today, so when people tell you it flies by, it really does! These look so dangerous! I’d inhale them. Oh Yum! I love everything s’mores (and even had some on our recent camping trip). These gooey treats look like something I could sit and eat an entire pan of on my own! I’m so impressed you managed to whip these together with a fearless baby on hand! Such a perfect summer treat. congratulations on doing all this during baby napping time. I am impressed! these look great, and i am oh so pleased to hear that things are going well in the Fearless Family! Great minds think alike … and love s’mores! =) Off to check out your recipe! I’ve made those s’more bars too and I love them! In fact, I just made them last weekend at my younger daughter’s request. Hope you’re enjoying life with the new baby! look at you, baking & blogging during naptime. impressive! these smores bars look impressive! oh how fun to have your family visit…I bet they could not get enough of baby. and smores bars so agree what the perfect ending to a cookout meal! 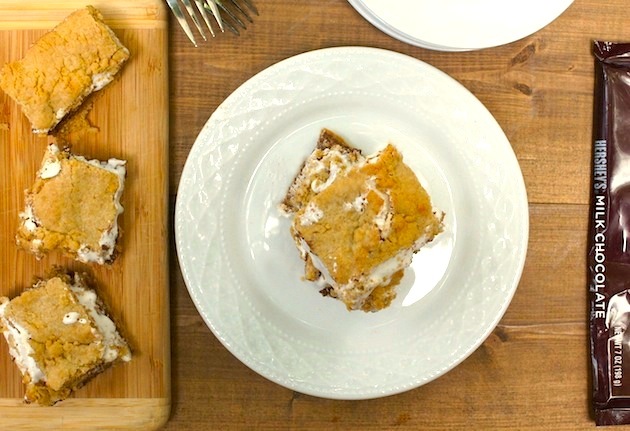 Your s’mores bars are inspired, and well done managing to cook, take photos, and write your blog and have a newborn and have company all at the same time! You have earned a nap. I LOVE these. They were a huge hit at my cookout yesterday and were gone before we even served food off the grill. They were as easy as you described and super delicious. Thank you! Awesome, Ashley! So glad they were a success! These look so incredible and easy to make! I love s’mores variations into bars, ice cream sandwiches, etc. so I am excited to try these out sometime soon! Just pinned these away for some July 4th weekend menu planning. Glad to hear they are easy to make…just what I’m looking for! And you’re back to baking/blogging already – very impressive! These bare look like ooey gooey goodness! Hope you all had a great visit! Warm, melty s’mores – my weakness! Love the “camping” feeling this gives me! A wonderful summer “cottage” tradition, that’s for sure! 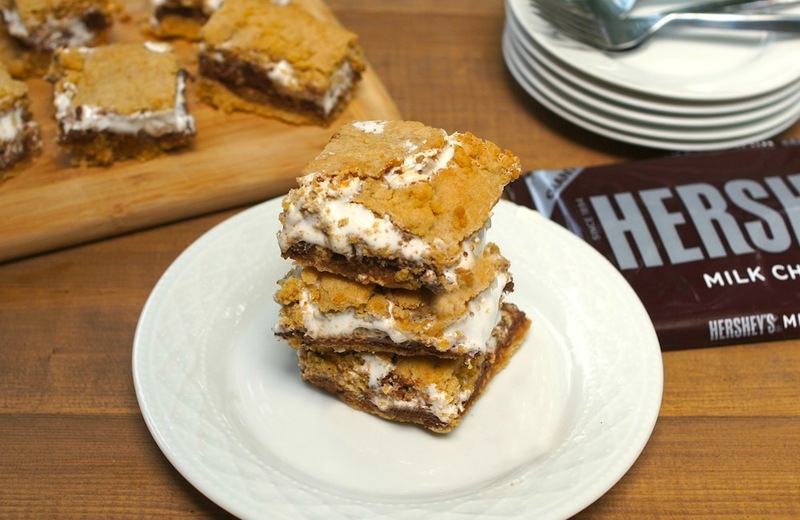 These look delicious, and simpler than other s’mores bars I’ve seen. Which reminds me… I have a s’mores brownie recipe I never posted! Been making these for years (about 30 years) .this is one of the best reicpes for a Girl Scout or family outing treat. Made these on the campfire (wrapped in foil) or on the grill (foil again) or on a tray in the oven. MMMMMM good. Previous post: Fearless Baby Has Arrived!